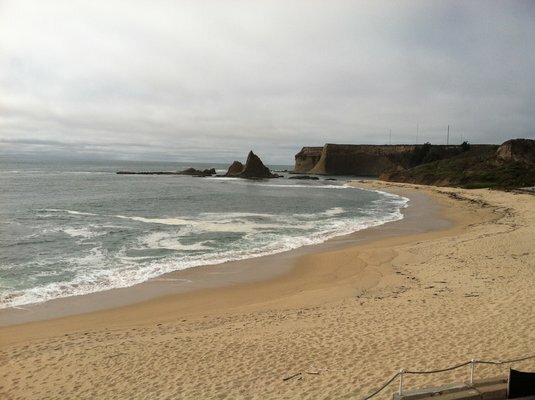 Martins Beach photo from Yelp. So I’m on jury duty this week, and as I walk out of the courthouse on our lunch recess, I happen to see an older bearded gentleman in a suit, surrounded by some other suits, holding forth to a small pack of reporters. “Oh, a courthouse steps interview,” I thought, so I sidled up to hear what was going on. I quickly learned that the bearded gentleman was renowned California lawyer Joe Cotchett, and that he was there representing the Surfrider Foundation in a lawsuit against venture capitalist Vinod Khosla. Khosla, you see, bought a bunch of land south of Half Moon Bay back in 2008 and promptly closed off the access road to a popular beach that ran through the land. Called Martin’s Beach, it became a rallying point for locals who had been accustomed to using that beach — via this road — for decades. It seems that Khosla’s lawyers had resisted bringing Khosla himself into court, but this morning, the judge ruled that he would have to appear, which was the occasion of Cotchett’s impromptu press conference. I hung around, pulled out a notebook, and got a few words with both Cotchett and former U.S. Rep. Pete McCloskey, himself a partner in Cotchett’s firm. I also heard them tell the story of how the firm sent McCloskey down to Martin’s Beach to jump the gate and trespass on Khosla’s land, which he did — though the sheriffs declined to arrest him for that, much as I’m sure the lawyers would have loved that. So I banged out a couple hundred words after lunch, and filed my quick little story before going back into my (totally unrelated) trial. All in all, it was a pretty classic moment in courthouse reporting, and almost made me wish I was on that beat.